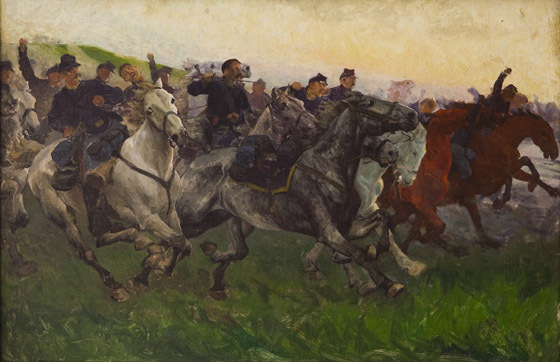 William T. Trego | Catalogue Raisonné | Yankee Cavalry Charge, n.d. In addition to an unfinished painting of a house on the back, perhaps by Walter Baum or a member of his family, there is an inscription in black paint: "CAVALRY SKETCH/Wm. T. Trego/owned by Mr. and Mrs. WE Bau[m]"
Though apparently only a sketch, and somewhat unfinished, the work has a marvelous dynamic quality not unlike Trego’s painting The Charge of the Fifth Regulars at Gaines’s Mill and is an excellent example of one of his specialties--Cavalry charges. Owned by Walter E. Baum, who may have obtained it directly from the artist or his estate, it has been passed down through the families of his descendants since his death in 1956. The painting is in basically good condition. However, there is at least one instance of paint loss on the surface, and it would benefit from cleaning.